The whole family of the American, his parents, his two sisters, his two brothers and his fiancée have been present an endearing act. 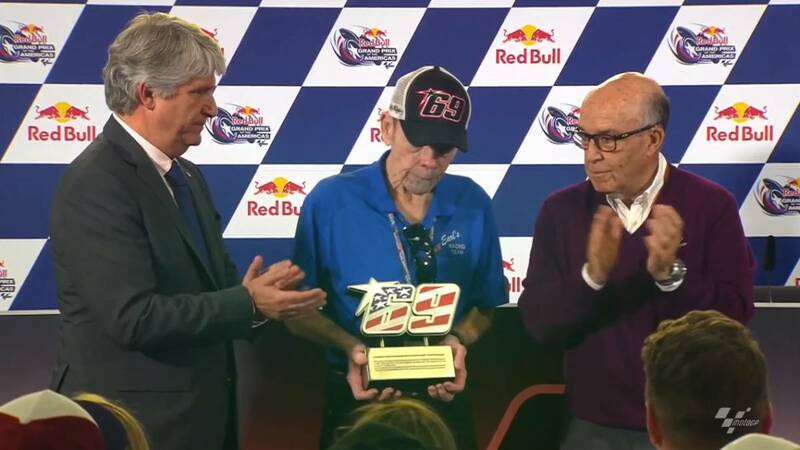 No one can take on his MotoGP from now on the number 69, that of Nicky Hayden, that has been removed forever from the competition in an emotional event held in the press room of the GP of the Americas. Up to this point the whole family of the champion of the class of 2006, who died in a traffic accident in May 2017 while training in Italy with his road bike, has come. His parents, his two brothers, his two sisters and his fiancée, have been there, excited and holding the guy as they could in a ceremony in which several have not been able to contain the tears. Earl, the father, and Tommy, one of his brothers, have been accompanied at the table by Carmelo Ezpeleta, CEO of Dorna, and Jorge Viegas, new president of the FIM. Tommy explained that "the 69 is a very special number in the Hayden family, because in addition to Nicky used to be used by our parents and also by ourselves. " Many MotoGP riders stopped their work in the box to accompany the Hayden family, such as Rabat, Bagnaia, Abraham, Márquez, Lorenzo, Crutchlow or Nakagami. Also former pilots such as Schwantz, Mamola and Capirossi. and one from Moto2, Joe Roberts, the American whose face, due to the marked childish features that it presents, is to an air precisely to Hayden, of which he says: "I saw him win for the first time at Laguna Seca and he was the great inspiration for me to become a racing driver" .